Recently I was reading an article on teamwork in a management journal. The author of the article was telling that a wolf-pack hunting its prey contains many features of an effective team. Later, I saw in a wild-life movie, a group of forest dogs hunting its prey. It was truly amazing. They have all the features of an ideal team. Let us briefly examine the phenomenon of a pack of forest dogs hunting its prey from the point of view of teamwork. First, there is the common goal, to kill and eat the prey. Second, no leader and hierarchy; it is a leaderless team without hierarchy. Third, there is perfect unity, harmony and equality among team members. Fourth, unique role for each member. As the dogs surround the prey, each dog spontaneously assumes a specific position which keeps the prey from escaping the net. Fifth, skillful adaptation to the changing situation. Each dog flexibly adopts its speed and position in tune with the other members of the team and to the movements of the running prey. Sixth, there seem be a silent instinctive communion among the members on who has to attack first and who has to follow. And finally, harmonious sharing of the kill. Can there be a more ideal team? When you watch these forest dogs in action, it is almost musical. There is a great beauty,harmony, rhythm, grace and orchestration in the way they run, surround the prey, organise the attack, execute the task and achieve the goal. Such groups in Nature are almost a single organism; it is the spirit of the group, acting through each individual member,with the instinctive intelligence and harmony of Nature. In comparison to this harmonious perfection of Nature, our human organisations—-with its rules and regulations,numberless meeting and committees which do nothing more than spitting out useless verbiage and many levels and hierarchies of managers and leaders with each one putting on over his neck some silly title or designation—-appear so clumsy,stupid and clownish. However, in a more integral perspective human groups have to achieve a more conscious perfection and a more diversified harmony than that of Nature’s herds. What Nature does subconsciously and instinctively we have to do it more and more consciously and intuitively with a much greater emphasis on individual uniqueness and diversity. In human teams we have to strive for a greater diversity of nature, temperament and cognitive outlook among team members. According to atleast research on teamwork, creativity or collective intelligence of teams are considerably enhanced by “cognitive diversity” among the members of the team. But to harmonise such a complex human diversity, we have to discover a deeper and inner unity of consciousness beyond the ordinary surface mentality in which most of us live. 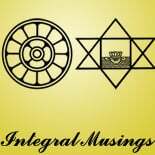 This entry was posted on May 20, 2014 by integralmusings in Integral Management.